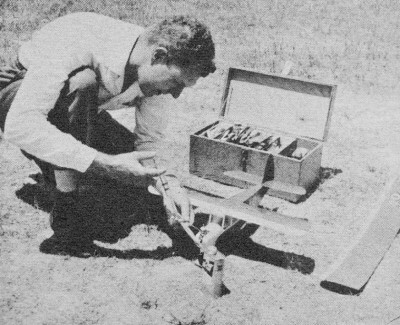 Pendulums were used way back when to help keep free flight airplanes in a controlled climb during the powered phase of the flight, and then in a smooth glide back to terra firma. A weight was suspended from a wire that pivoted on an axle, and a pushrod was attached to a movable elevator. If the nose pitched up too much, the pendulum's inclination to always point toward the center of the Earth would move the pushrod in a direction to apply a little down elevator, and vice versa for a downward pitch. I have planned to give it a try some day, but as with so many other things, I just haven't gotten around to it. Interestingly, there is still a form of free flight glider flying in Germany that uses a weather vane arrangement to control the rudder for keeping the airplane fling in a straight line. The goal is to record the farthest distance possible. Author-Designer Keith Laumer until recently with USAF is now a U.S. Foreign Service Officer stationed at the American Embassy in Rangoon. Shown is C/L Pete. 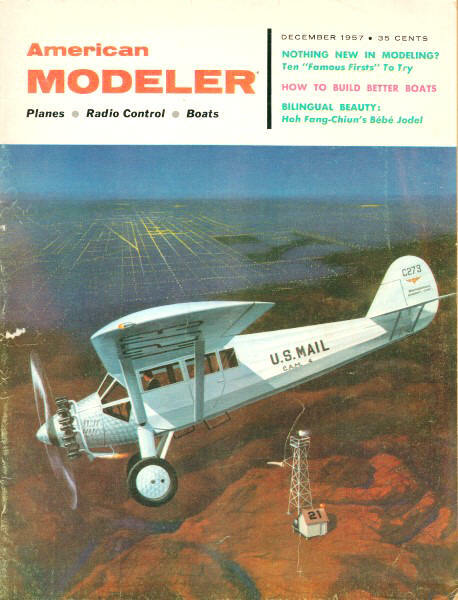 Your model lifts from the runway, eases into a right turn, builds up speed and the bank tightens until the wing is almost vertical; a crash seems certain ­ but not this time ... Pendulum Pete is at the controls! Power cuts, the plane rolls out into a glide and drifts across the runway as if reluctant to touch down; Pete is holding her nose up for a three-point landing. On the next flight, with a little less right rudder, Pete will cruise in the purposeful manner of a controlled airplane, with steady climb and smooth approach glide. After a few free flights, a little variety is in order; so out with Pete's control line wing, add a set of lines, and you're airborne again in two minutes with a fast and maneuverable sport job. And if you want to see how Pete will act with a tricycle gear (or a four-wheeler, just for fun), pop another gear in place - no tools needed. Pete flies nicely over land or water with floats installed, coming in on grass without a scratch. If you've never seen a realistic float model touch down on water, bounce off. touch again with a dash of spray, and swing into the wind to wait for a pick - up - you owe it to yourself to let Pendulum Pete show you how it's done. Construction? Simple! 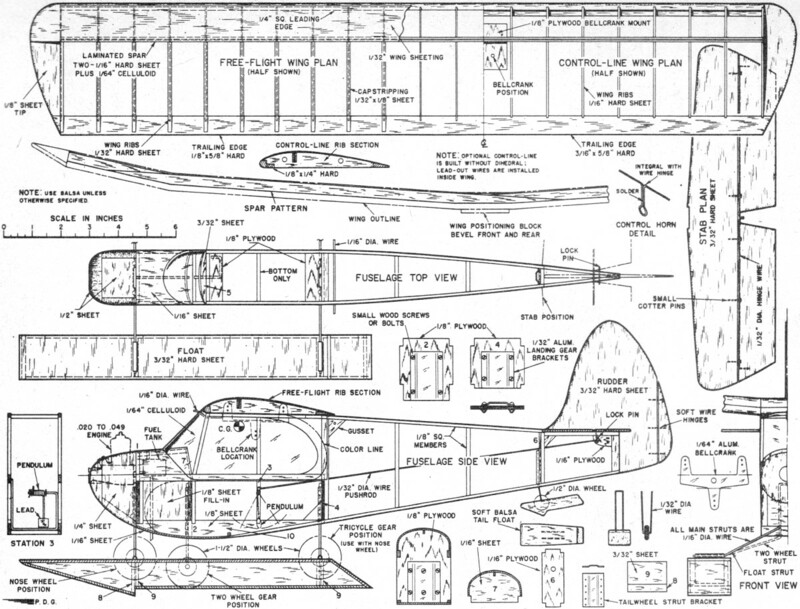 Fuselage is a simple box with three sheet balsa parts and four plywood bulkheads. Tail assembly is sheet balsa, and the two interchangeable wings feature one-piece tips and identical ribs. Two sides are laid out using hard 1/8" sq. balsa. Cut two of each piece, assemble first side over plan (protect with waxed paper); second side is built directly over first. While side assemblies are drying, bend pendulum support from 3/32" brass welding rod to exact size indicated. Pendulum is soft iron wire (a medium-size paper clip is ideal). Wire is wrapped around support shaft eight turns. A loop is formed at one end, the other trimmed to proper length. Lead 1/8" x 3/8" x 3/8" is soldered to long arm. Washer is soldered to support shaft behind pendulum, and pendulum retained by wheel collar or by pin inserted through small hole drilled in shaft end. When thoroughly dry, sides are removed from plan, sanded smooth before separating, and joined on bulkheads 2 and 4, with plates attached. The firewall, part 1, is drilled for radial mount or notched for beams, to fit engine used. Mounting nuts are glued to rear of firewall or under beams and retained by strip of balsa glued over them. Firewall is installed; sides are joined at the rear (note bevel of rear posts). Parts 5 and 7 are assembled, 1/8" sq. cross pieces added. Gussets are glued in place. Plywood plates are put on at front and rear of cabin roof. 1/16" sheet balsa planking is attached to bottom from bulkhead 1 to cross-member between stations. 2 and 3. First section of fuselage sides is filled with 1/8" sheet balsa. Interior of tank compartment is fuel-proofed and No. 1 Perfect Fuel Tank (or equal) installed, after which add sheet balsa covering. Sheet balsa cowling is built up, side pieces first, then top and bottom, finally the nose. Allow rough cowl assembly to dry before shaping with sharp knife. Entire fuselage should be carefully sanded and coat of clear fuel proofer applied to planked surfaces. Depending on engine used cowl may be detached as unit or cut along thrust line so only top half is removable. Pendulum support is glued in place and reinforced with strip of nylon glued over wire and to sides of 1/8" sq. balsa members at station 3. Front and rear wing mounting hooks of 1/16" wire are added. 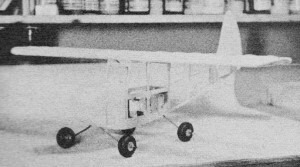 Entire fuselage, including planked surfaces, covered with light silkspan, wet, and clear fuel proofed. Rudder and elevator are cut from medium hard 3/32" sheet balsa and sanded to streamlined shape. Rudder tab is cut from rudder and mounted using soft copper wire. Movable elevators are cut from stabilizer and elevator hinge and control horn wire bent from 1/32" piano wire. Locking pin plate is cut from tin can, soldered to control horn. Small cotter pins are slipped over hinge wire, and notches to receive them are cut in elevators - front edges of which are grooved to receive hinge wire, which is then glued securely. Cotter pins are inserted in trailing edge of stabilizer. Elevator is clear doped and sanded smooth. Push rod should be bent to exact length and engaged in elevator horn before elevator is glued in place on fuselage. With fuselage in horizontal position elevator should rest horizontally. Pendulum arm may be bent slightly fore or aft to adjust this neutral setting. Glue rudder in place. Free flight and control line wings employ identical leading edges, trailing edges, spars. Ribs are basically similar but control line ribs have two holes for lead-out wires and additional notch for leading edge reinforcement. For free flight the spar is built first. Two identical spars are cut out in four pieces each from hard 1/16" balsa. A full-length spar pattern is cut from celluloid. One set of spar members is assembled and glued to celluloid; the other set is glued to other side of celluloid, forming three-lamination spar with celluloid in center. When spar is completed rib positions are marked and 24 ribs added. Leading edge of 1/4" sq. balsa is next assembled over plan, marked, and attached to front edges of ribs. Trailing edge, of pine or hard balsa, is cracked to proper dihedral angles and attached to rear ends of ribs. Tips, cut from 1/8" balsa, are added next and structure sanded preparatory to planking leading edge. Hard 1/32" balsa is used to cover top of wing from leading edge back to main spar. This planking is carefully cut to size and attached in four pieces. Center section is covered from leading to trailing edge on both top and bottom surfaces. 1/32" x 3/32" hard balsa cap strips are installed to complete wing structure. Cap strips are glued first at leading edge, then at trailing edge; care must be exercised to ensure their contact with ribs full length. Entire wing is now carefully sanded. Construction of control line wing is identical with that of free flight wing except for additional leading edge stiffener. It must also be noted that control line wing is flat and employs one piece leading edge, trailing edge and spar. Top center planking is not added until bellcrank is put in position. Plate of 1/8" plywood is installed in center section to receive bellcrank. Lead out wires are installed inside wing. Positioning blocks, cut from 1/8" sheet balsa to fit inside cabin roof structure, are glued to underside of both free flight and control line wings. Special bellcrank is cut from 1/64" aluminum and bent as indicated. Slots for bellcrank arms are cut in underside of wing's center section. Make sure controls work freely before covering top of center section with 1/32" balsa. Wing is covered with light Silkspan, wet, clear fuel proofed, sanded lightly. A complete set of landing gears for Pendulum Pete includes one nose gear, one main gear (two wheels); a tail wheel, and two two-wheel gears used together for a four-wheel gear, one being used with the nose wheel for tricycle gear. In addition, set of floats may be made and mounted on same struts as four-wheel gear, provided wheels are secured by collars to enable them to be removed. Floats are constructed entirely of 3/32" medium hard balsa. Aluminum mounting fittings are bent from 1/64" aluminum, sandwiched between bulkheads 8 and 9, and 10 and 9, respectively. A small hole should be drilled through mounting assembly and pin or bolt inserted to secure aluminum firmly. Completed mounting assemblies are glued to float side. Other side is added and bottom planks installed. Interior of each float should receive two coats of fuel-proof dope and all joints reinforced with glue. Top covering pieces should be sealed with two coats of fuel proofer before being glued in place. Back plates are added last, and entire pontoon carefully sanded. Floats are given a coat of clear fuel proofer and final sanding before covering with silkspan. Tail float is carved from soft balsa and 1/32" wire strut glued in place. With all parts fuel proofed and sanded, entire model should be sprayed with two coats of white fuel-proof dope. When thoroughly dry, all surfaces should again be sanded lightly. Now for the windshield. Since no two models are identical, it will be necessary to make an individual pattern to fit yours. Use a piece of stiff paper, such as a magazine cover, and after estimating position of front wing mounting hook, punch a hole and center pattern on mounting hook. Wrap pattern around sides, mark position of edges with pencil. Cut out along lines and check fit. When pattern fits perfectly, place it on sheet of 1/64" celluloid and trace outline with sharp razor blade; crack and strip off excess. Install windshield, gluing first at center; then bend around one side of cabin and glue. When first side is thoroughly dry, glue other. 1/8" plywood 2" x 9" for bulkheads, plates; 1/16" plywood 3/4" x 1 1/2", bulkhead; (3) 1/8" sq. 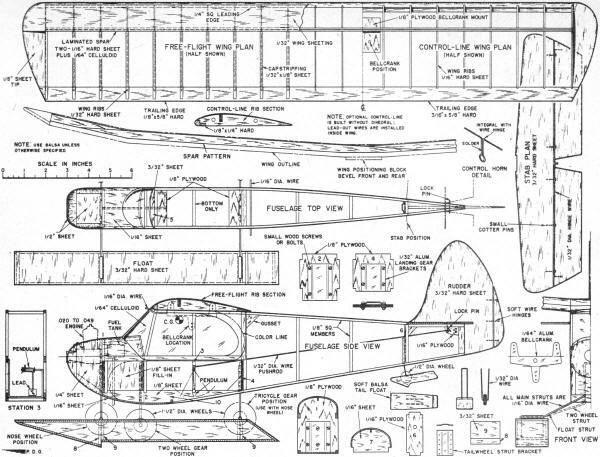 balsa (hard) 36", fuselage; (2) 1/8" x 1/4" balsa (hard) 36" fuselage, C.L. wing; (1 1/2) 1/4" x 1/4" balsa (med.) 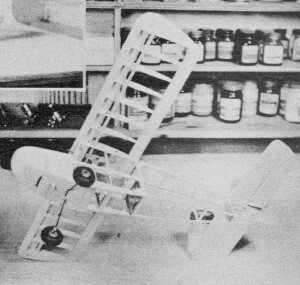 36", L. E.; (3) 1/32" balsa (hard) 3" x 36", ribs, plank, caps; (1) 1/16" balsa (hard) 2" x 36", spars, fuselage cover; (2) 3/32" balsa (med.) 3" x 36", tail assembly, floats; (1) 1/8" balsa (med.) 3" x 15", wing tips, fuse parts; 1/4" balsa (soft) 2" x 4", cowl sides and bottom; 1/2" balsa (soft) 2" x 4", cowl top and front; 1/8" x 3/4" pine 43", trailing edges; 1/32" aluminum 21/2" x 8", L.G. plates, bellcrank: 1/64" aluminum 1 1/8" x 6", float attach. plates; 1/32" piano wire 36", push rod, elev. hinge, tail gear; 1/16" piano wire 44", L.G., wing mounting hooks; 3/32" brass rod 6", pendulum support; 1/32" soft steel wire 4", pendulum; lead 1/8" x 3/8" x 3/8", pendulum weight; 1/64" celluloid 10" x 10", windshield; 1/64" celluloid 2 1/2" x 32", spar lamination; light Silkspan 2 sheets; small fuel line 6"; clear fuel-proof dope 4 oz. ; white fuel-proof dope 4 oz. ; colored fuel-proof dope 2 oz. ; 6 small cotter pins; hinges; 12 bolts 1/16" x 3/8"; L.G. plates; (1) 1/4 oz. tank (Perfect #1); (7) 1 1/2" wheel (Perfect #34); 1/2" wheel (Perfect #30). Windows must be masked off and another coat of white sprayed on front half of fuselage. One-piece mask for windows may be made by tracing pattern onto tracing paper, covering with tape and cutting out, after which paper backing can be stripped from tape. A similar mask should be made to cover entire front portion of model which is to remain white. Planked portion of wing should be masked off, as well as sides of floats. Final color finish is sprayed on entire unmasked portion of fuselage, wing and floats, after which tape is removed carefully to avoid tearing paper. Decal numerals can be added to suit individual. Flying. First make sure model balances as indicated. 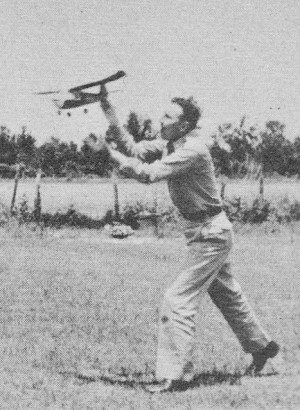 Then, with elevator lock pin installed, hand-launch over grass. Correct any nose- or tail-heavy tendencies by adding weight. When flat glide is achieved, remove locking pin and try a low-power flight. Slight nose-heaviness will simply cause model to drop a little more rapidly in the glide, although pendulum will hold the nose up. Excessive tail-heaviness will cause rapid up-and-down fluttering of tail. For control line flying three-wheel gear is preferable to two. Control line wing is installed by first sliding pendulum off support shaft and disengaging from push rod. 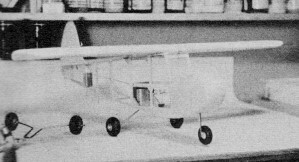 Push rod is then engaged in bell crank and wing attached by rubber bands, wing positioning block fitting inside cabin roof to key wing in position. When flying Pendulum Pete with floats installed, do not attempt to ROW unless water is smooth. However, when hand-launched, Pete lands easily even in choppy water. Always launch very gently as a sudden lunge will cause pendulum to swing back and dive the model into the ground.